Steve Coulter reviews the latest title by Zambian economist Dambisa Moyo, looking closely at what the West will lose to the emerging economies of the East. 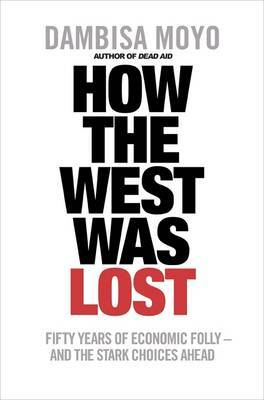 How the West was Lost: Fifty Years of Economic Folly – and the Stark Choices Ahead. By Dambisa Moyo. London: Penguin. January 2011. It is difficult to be certain exactly when the West collectively decided to lie back, take things easy and hand supremacy to the emerging economies of the East, notably China. Perhaps it wasn’t a conscious decision – the West, after all, continues to delude itself about its technological, moral and cultural superiority over ‘the Rest’. Dambisa Moyo, a Zambian-born, Western educated economist, is having none of this, arguing that the root of this shift of power lies in a series of political and economic choices made by Western governments, consumers and business people. These choices will, within the next 40 years, see the world dominated economically, politically and possibly militarily, by currently emerging economies. How has this come about? In Moyo’s view, the West responded to globalisation and the emergence of new technologies after the Second World War by foregoing saving and investment to leverage for itself an elevated and unearned current standard of living instead. This was largely paid for by developing world savings, channelled through a series of real estate and increasingly unproductive investment bubbles. The post-war era was characterised by the serial misallocation of resources in various realms – often with the best of intentions. Exhorting people to own houses in the name of creating a property-owning democracy shifted productive capital to the house building industry and invited homeowners to treat their dwellings as financial assets, with disastrous consequences. Unaffordable pension entitlements were handed to baby boomers who had no intention of dying when they were expected to, bloating public debt. Manufacturing was downgraded, science and technology downplayed. Financial services sucked up numerate graduate talent that might once have gone into industry. The West played a trade game of comparative advantage and profit-maximisation, while the goal of the Rest was absolute advantage and the socialisation of gains. Moyo writes briskly and doesn’t pull any punches. Despite some glaring errors (Fiat came to the rescue of Chrysler, not GM as she states) the book gives an extremely clear and coherent economist’s view of the policy errors responsible for our malaise. Two things are lacking, however. First, is a political economy analysis of how and why this self-indulgent short-termism came to dominate public policy. Her answers to this question are mostly functionalist ones: because economic self-interest was subordinated to military and political grandstanding. And her solutions are occasionally alarming: at times suggesting that democracy should be abandoned so that policy can be implemented more efficiently without having to bother with tiresome things like public opinion. Also missing is a historical sense of how regimes inevitably rise and fall. Although she tries not to, Moyo seems to treat Western decline as absolute when it may just be relative and natural – such is the vehemence of her broadsides against its leaders. Is this decline reversible? Perhaps the West, like the latter generations of the Buddenbrooks family in Thomas Mann’s classic novel, has simply lost the hunger to lead, preferring to enjoy the short-lived fruits of its erstwhile superiority while it can? One day, perhaps quite soon, the Chinese will demand defined benefit pensions, more bank holidays and satisfying careers where they can express their creativity. Their place at the head of the table won’t lie vacant for long. This review was originally published on the LSE British Politics and Policy blog on 23rd January 2011. Steve Coulter is Senior Economics and Business Analyst for BBC News, and writes regularly for the BBC News website on UK economic policy. He is also an Associate Fellow of the Social Market Foundation think tank and wrote the SMF’s recent paper on industrial policy, Manufacturing Prosperity. He is currently working on a project on the media’s coverage of the financial crisis with the Journalism School of City University. Steve received his PhD in European Political Economy from the LSE’s European Institute. Read reviews by Steve.